This was the amazing tour company with which I booked my trek. They took care of us and made sure we had an amazing experience. For a trek like Salkantay, my boots were my lifeline. Mine were made by Keen and well broken in. They were waterproof and comfortable. I bought some moldable arch supports to make them even more efficient for me. Served as tea or just chewing the leaves, the Coca helped with acclimation to the altitude. The flavor was a lot like green tea and we were awoken every morning with a steaming, hot, sweet glass to get our day going. Worried about altitude sickness, I went to my travel doctor before the trip and he prescribed me Diamox to help combat the symptoms. It worked wonderfully and the altitude caused me very few problems throughout the trip. Our Salkantay trek ranged in elevation from 5,971 feet (1,820 meters) to 15,157 feet (4,620 meters). The Salkantay trek lasted for five days / four nights. The guide on my trek was Simon Puma. Puma was an amazing trail guide, he taught us so much, encouraged us and was a friend. Plus he played his Peruvian flute for us. I was able to rent these from Alpaca Expeditions. They were, for me, absolutely vital for all of the downhill switchbacks. Some of the hike is in the jungle and insects (especially the biting kinds) become an issue. I used a natural insect repellent made with Eucalyptus and suffered one bite. Many of my co-hikers used Deet-	laden repellents and they were bitten up. I also pre-treated my outer layers of clothes with repellent designed for clothes before I went to Peru. The hike took us through many terrains including the jungle. In the jungle the humidity was high, plants overgrown and insects were active. 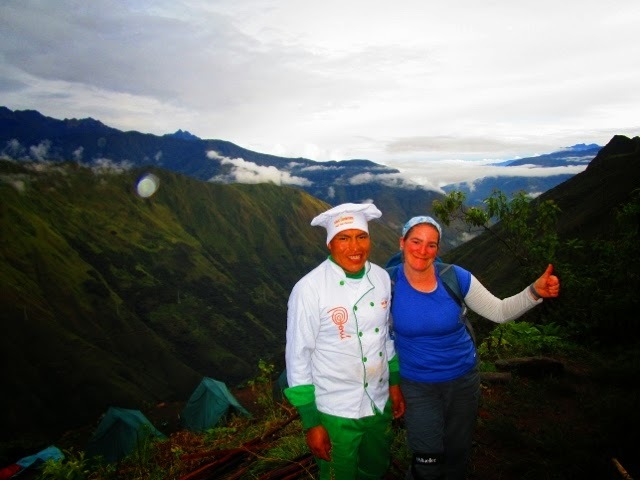 We may have been hiking in the middle of nowhere, but we had a Chef and 3 porters with us. Our Chef, Herman, was able to concoct the most amazing dishes in the primitive kitchen space he had available. I felt like I was eating at a 5 star restaurant for every meal. The weather on Salkantay changed frequently. Sometimes we were freezing cold, wearing gloves, hats, scarves and several fleeces. Other times it was hot and the sun was beating down. For that reason, I always dressed in layers. To further protect my skin from the sun and insects, my innermost layer was always a long-sleeved, white wicking shirt from Patagonia. This ancient Incan city was the goal of our journey. Being on the Salkantay trek, not only did I get to see it up close, but also I saw it from afar, from an side most tourists rarely view it from. 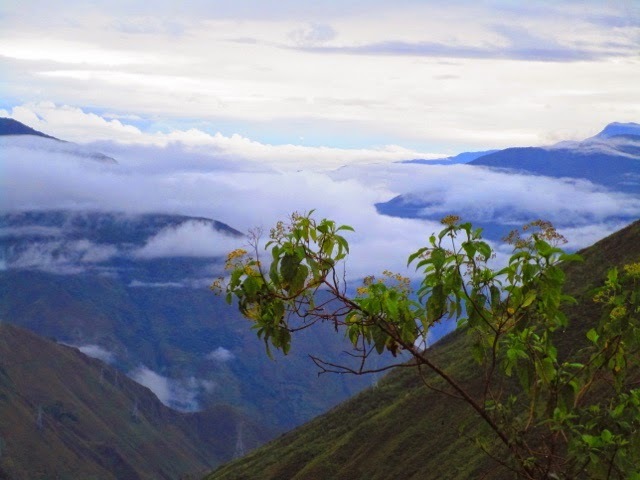 Going from the rocky high-altitude Andes to the Cloud Forest to the Jungle, the nature we saw was so varied. I got to see Citronella growing wild, bright colored flowers, butterflies, chinchillas, coffee and coca plants as well as raging water, mountain peaks and panoramic views. During the trek pretty much the only people we saw were those in our group, we rarely saw others. 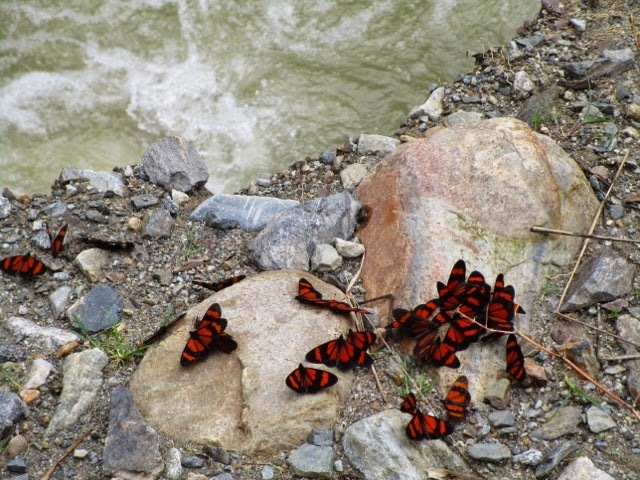 The day we arrived in Hidroelectrico and saw other tourists our solitude ended. I missed it. Alpaca Expeditions provided us with 3 porters (and 2 horsemen for the first half of the trek) to carry our gear. 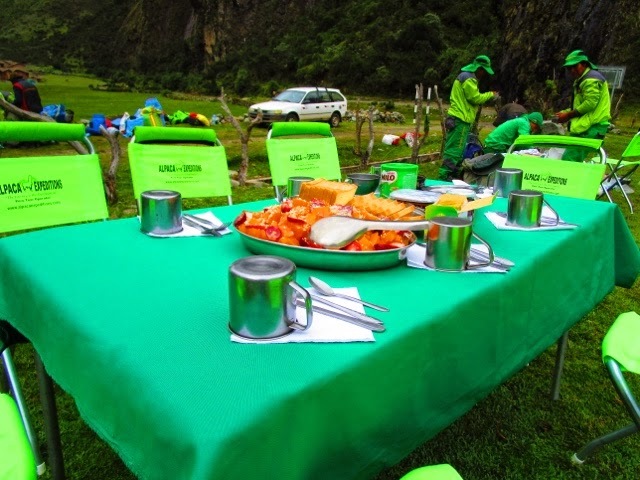 These men were amazing – not only did they carry so much more weight than we did, but they arrived at our site faster, set it up AND cooked our meal – usually before we had even arrived. This is the native language of many individuals in Peru, especially those who live in the Salkantay area. We learned how to say ‘hello’, ‘let’s go’ and ‘thank you’. My trek took place at the end of the rainy season. It was still quite rainy. 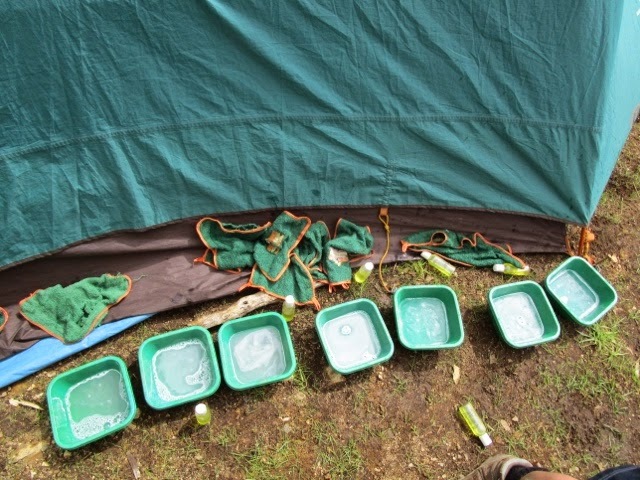 We experienced rain daily and most nights it rained on our tents. The rain also caused landslides, mudslides, rockslides and washed out trails and roads. 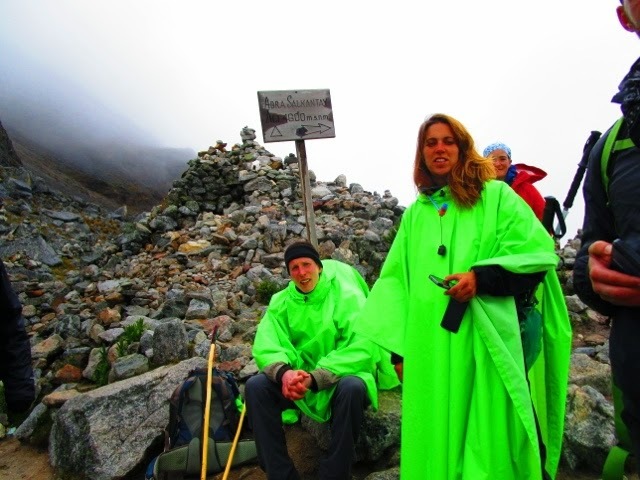 We did have magic ponchos - every time we put them on, the rain stopped! Yes, of course we had rain, but we also had sun. As Peru is near the equator, the sun was intense. I wore a lot of sunblock, SPF 50. I also wore long sleeves even in the warmer, more humid climate of the jungle. I only ended up with a small bit of sunburn on my ears, nothing more. The terrain we traveled was varied. We started at very high altitudes and rocky trails, we moved into the cloud forest and then into the jungle. Trails were often muddy, rocky, slick or all three. While hiking we saw so much undergrowth on the trails around us. As a result, we could also see how easy it was for a city such as Machu Picchu to be completely hidden for centuries. On this hike, the views I had were unlike any others. Our third night campsite was on a cliff with a panoramic view of the mountains. During the third and fourth days we had views of Machu Picchu from the side, unlike those most tourists have. Water is vital to survival. Out in the mountains, we had water all around us in the form of rain, waterfalls, rivers and more. However drinking water had to be boiled. Before every meal and every morning upon awaking, we were given a small bucket of hot water with which we could wash our hands. 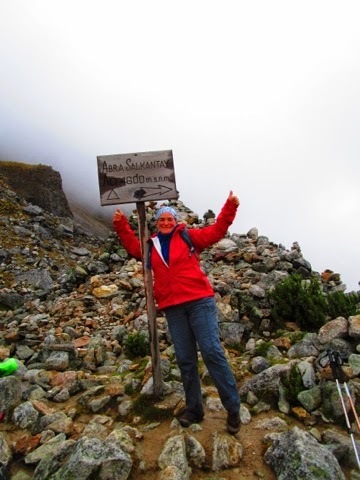 My Salkantay expedition was amazing, it exceeded my expectations and pushed me to exceed my own expectations of myself. I am so glad that I took this opportunity! Peruvian dishes are known for containing potatoes, and when potatoes were not used, yucca roots were eaten like potatoes. Sometimes we even had both. Our trails were full of switchbacks that zigged and zagged up and down the mountains. i live by the motto: have passport, will travel.